The College’s inaugural White Coat Ceremony was supported by the Gold Foundation through a grant generously given by Foundation board trustee Elaine Adler and administered through a partnership with the American Association of Colleges of Nursing. During the ceremony, the nursing students were greeted by Student Nurses Association President Dwayne Husbands, who urged them to get more involved in Association activities, which include blood drives, opioid overdose prevention training, and numerous leadership opportunities. Addressing the students, CNR alumna Jeanne Whalen DeMarzo SNHP’83 emphasized the importance of placing humanism front and center in their healthcare practice. She went on to encourage the students to work to develop relationships with their patients and families and that taking the time to listen could make all the difference in the world. “In the words of Mother Teresa, ‘kind words can be short and easy to speak but their echoes are truly endless,’” she said. 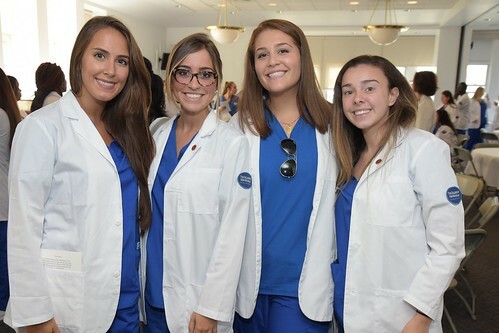 As students came forward to be officially “cloaked” in their white coat, there were many hugs and smiles exchanged with faculty and fellow students, as they celebrated the next important phase in their nursing education at CNR. “We trust that this ceremony today helps instill in each of you – a stronger sense of responsibility for the privilege each of you will have in caring for your patients; that you will be inspired by the legacy of Dr. Gold and his deep sense of compassion and his enormous heart; and that each of you as a CNR nursing student will be dedicated to the oath to compassionate patient care you took today,” said Dr. Adrienne Wald, assistant professor of nursing.